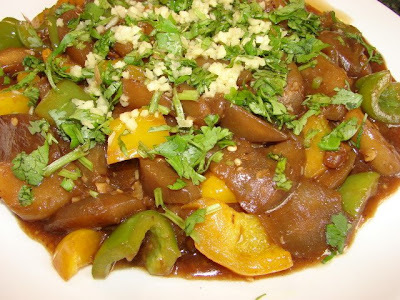 Hong Shao or braised aubergine is a nice simple dish. I like it without meat. Normally the aubergine is deep fried first before braising, but deep frying can absorb a lot of oil. Here is a method that does not need too much oil and the aubergine is still very soft and silky. Do use freshest aubergine if you can, aubergine that has been sitting around in the fridge for over 5 - 6 days tends to be a bit tough to soften, I don't know why but had found out the hard way several times. 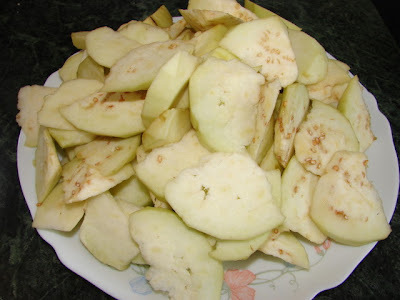 It is easier to cook the aubergine if cut in this shape like picture above. Just rotate the aubergine as you slice, you will then get this irregular triangular thin slices. You can leave the skin on if you like, I find without the skin, the mouth feel of the aubergine is much silkier. Stir fry the sweet pepper with 1/3 of the garlic and ginger with 1 tbsp oil till softened. Take out and leave aside. In the same wok without washing it again, top up with about 4 tbsp oil and the remaining garlic and ginger, chuck in the aubergine straight away, with medium heat keep stirring, you will see all the oil is absorbed by the aubergine very quickly and aubergine getting browner at the same time. Do not panic and add any more oil just keep stirring till the aubergine pieces have become soften and moistened on the surface. Mix all the sauce ingredients (except soy) together, pour into the aubergine, stir and let this braise till the aubergine pieces are really soft. Add in the sweet pepper and continue cooking for another minute or two, then thicken with cornflour, taste if salty enough if not add dash of light soy. Add a bit more water if the sauce is too thick for you. Plate up. For a fresher taste, sprinkle with coriander and more chopped ginger then drizzle on some sesame oil. * If you don't like sweet pepper you can leave it out. ** If you like the aubergine spicy, you can either add chopped chilli or chilli oil. That looks delicious, I love aubergines and will definately snag this for me!